Did you know that over $30 billion worth of phones will be lost in the U.S. alone this year? Yeah, that number shocked me a bit as well. But it came from Lookout's 15 million strong user base and was part of their Phone Loss study compiled of last years (2011) data. They didn't stop there, either. They've compiled lists full of factoids about when and where phones are getting lost, and just how much it's costing us. Granted, Lookout sells a product to help find lost phones, but it's still fun to have a look at the numbers. Using the Foursquare API to turn Longitude and Latitude into a venue, they expound the numbers a bit as well. Trivia like the fact that in Chicago it's common to lose a phone in a church (number three on the list), while in London it common to do so in the pub (number one) come from this sort of data. Unfortunately, another thing they noticed is that many of the top locations in the U.S. where people "lost" their phones also happen to be cities with high crime statistics. These are just examples of the things you can find out about lost phones, but they have some good news as well -- 9,000,000 smartphones (that's one every 3.5 seconds) were lost then located with Lookout last year. That's a great reason to use an app like Lookout, or one of the many others, to help you find your phone when (not if) you lose it. There's a couple screenshots and the press release after the break, and you can check it out yourself by heading to Lookout's Mobile Lost & Found page. San Francisco — March 22, 2012 — Lookout, the global leader in mobile security, today released findings from the first-ever phone loss study, which revealed that lost phones, if unrecovered, could cost U.S. consumers more than $30 billion this year. 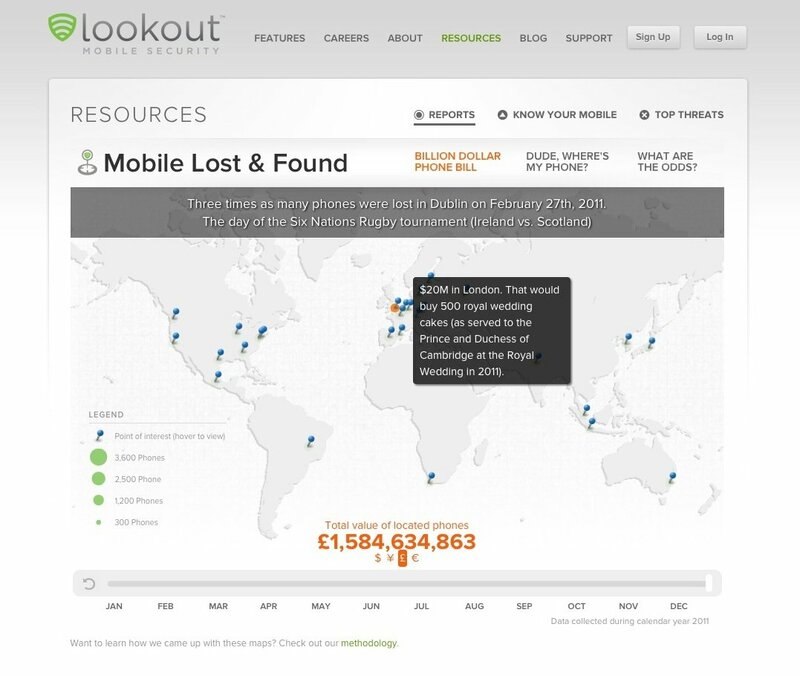 As part of the study, Lookout Labs today released the Mobile Lost & Found, an interactive website for people to discover the places where phones are most often lost, the likelihood of losing a phone by region, and the financial impact of lost phones. Lookout’s analysis, from more than 15 million users, found that demographics and behavior are the largest factors influencing phone loss. 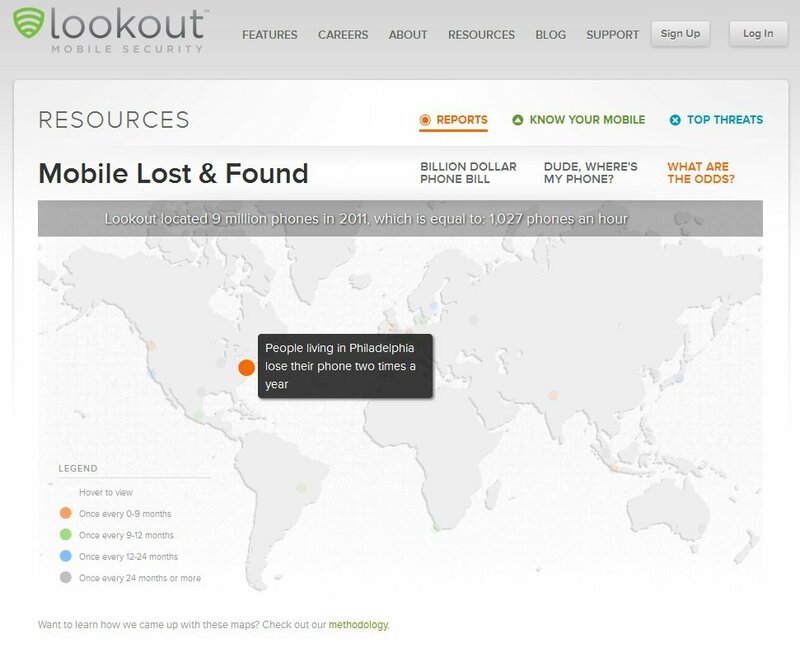 Over the course of 2011, Lookout located 9 million lost smartphones, which equals one phone every 3.5 seconds. In total, Lookout found that U.S. consumers lose their phone about once a year. If unrecovered, that could cost every smartphone owner more than $250 a year each. People in some U.S. cities have a higher chance of losing their phone: Philadelphia residents lose their phone two times more than New York City dwellers, while San Franciscans and New Yorkers lose their phones three times more than Chicagoans. Interestingly, many of the cities with highest rates of lost and stolen phones also were in the top ranks for the FBI’s most recent crime statistics. Cleveland, Detroit, Oakland and Newark, were amongst the 10 cities with the highest crime rates in the U.S.
Lookout also discovered that specific locations invited loss more than others, with coffee shops and bars topping the list. In addition, people lose their phone most often at night; 67 percent of phones are located between the hours of 9 p.m. and 2 a.m. local time. In Chicago, the 3rd most common venue to lose your phone is a church. In New York City, the top place to lose your phone is a fast food restaurant. In San Francisco, the leading venue to lose your phone is a coffee shop. In London, the leading venue to lose your phone is a pub. For more information, data and insights, please visit Lookout’s Mobile Lost & Found. The Mobile Lost & Found is a Lookout Labs project. Lookout Labs is part of Lookout's innovation arm and was created to explore and test out new ideas that push the boundaries of mobile. 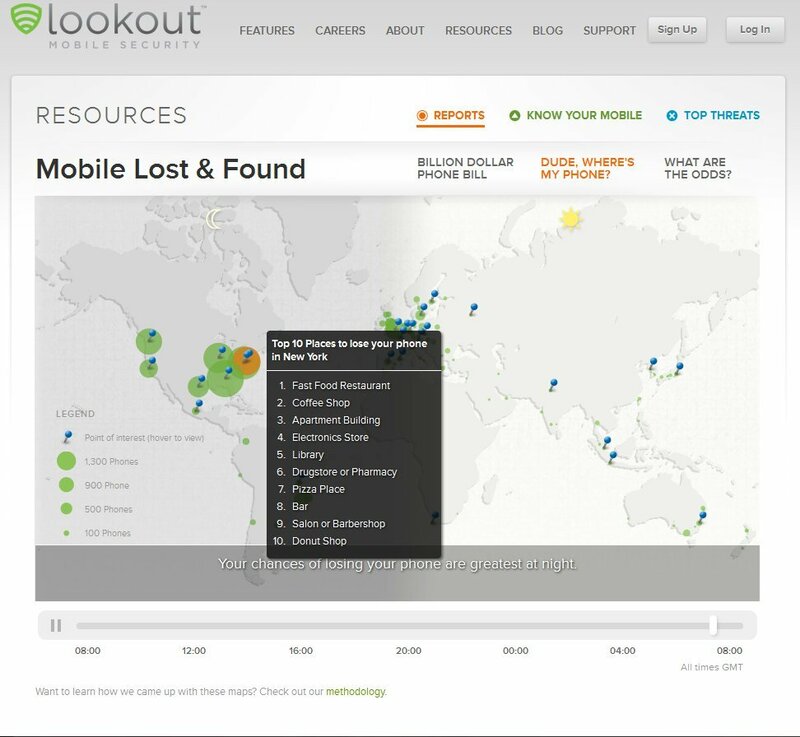 The findings in Lookout's Mobile Lost & Found are based on anonymized phone “locates” data performed by Lookout’s 15 million global users in 2011. Lookout Mobile Security has users around the world who use the Lookout application to locate their lost or stolen device. To determine popular venues where phones were lost in cities across the globe, the study used the FourSquare API. Each “locate” was mapped by FourSquare’s API to a venue type closest to the lost phone’s location. Lookout is a mobile security company dedicated to making the mobile experience safe for everyone. Lookout delivers award-winning protection from the growing threats facing mobile users today, including malware, phishing, privacy violations, data loss, and loss of the phone itself. Cross-platform, Lookout is designed from the ground up to provide advanced mobile protection while remaining lightweight and efficient on the phone. With 15 million users across 400 mobile networks in 170 countries, Lookout is the world leader in smartphone security. Headquartered in San Francisco, Lookout is funded by Accel Partners, Andreessen Horowitz, Index Ventures, Khosla Ventures and Trilogy Equity Partners. For more information and to download Lookout, please visit www.mylookout.com.